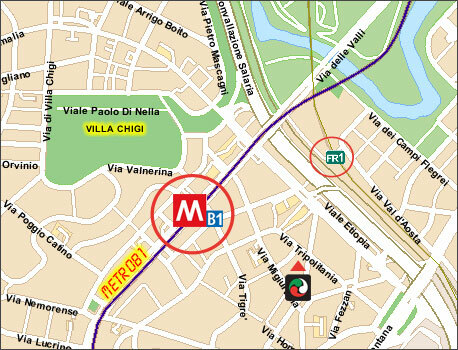 Via Tripolitania 34 is located very close to "Libia" station of Metro line B1. It is possible to walk to the Dojo form bus-stop of lines 233, 80, 83, 38 in Viale Libia. It is possible to reach Via Tripolitania from the train station "Nomentana" with the regional train FR1, at only one stop from Roma Tiburtina Train Station. The neighbourhood Trieste/Africano is reachable through the Tangenziale-Est, Etiopia or close exits; through via Nomentana, Salaria and other arterial roads.